Unknown Monet Pastel Found Hidden in Mounting #ArtTuesday « Adafruit Industries – Makers, hackers, artists, designers and engineers! Bargains always go down well with consumers, but a British art dealer was all the more excited to discover that he had unknowingly bought three pastels by Claude Monet for the price of two. 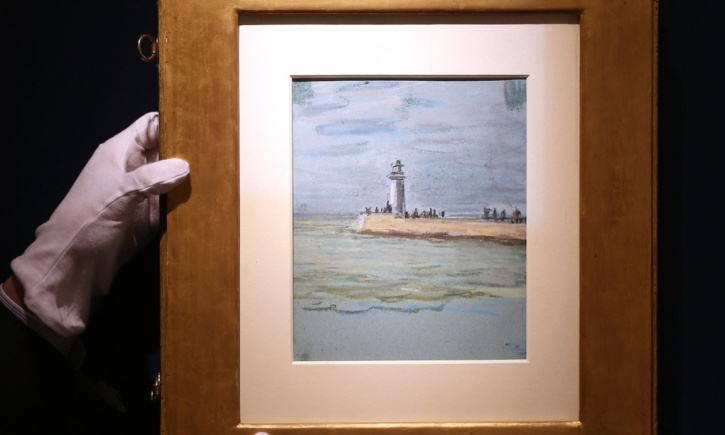 Jonathan Green, a director of the Richard Green Gallery in London, found a radiant, completely unknown third pastel by the French painter hidden behind the two others that he purchased at a Paris auction in 2014. Green headed home from France with what he thought were two wonderful, rare pastel studies of skies, in which Monet explored fleeting effects of nature and light. It was only later that he discovered the hidden treasure taped up under the mount of one of the sky pastels – a depiction of the jetty and the lighthouse at Le Havre in Normandy, where Monet grew up.